Welcome to our Monday segment, Making Up Cards Monday where we... well, make up cards. Most of them have inspirations behind them and sometimes you just wanted to make a funny card, or a card that had your flavor to it. Either way, you can read the cards and judge them for yourselves. At the beginning of each upkeep, that player gains 1 life for each permanent they control. At the beginning of each end step, if a player’s life total is 40 or more, they lose the game. Yup, a life gain card that kills yourself. At least that was the theme that Lolzor wanted to make. It started out as trying to make an instant win black card, but ended up being an entire cycle. 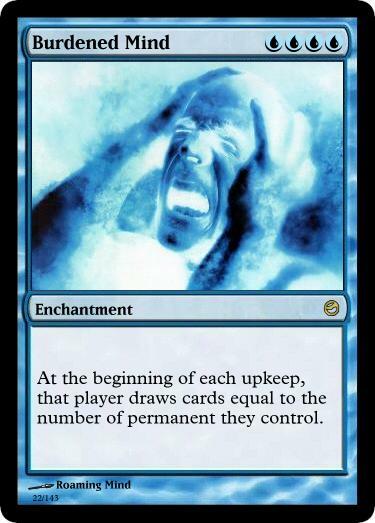 At the beginning of each upkeep, that player draws cards equal to the number of permanent they control. Somewhat abusable with shuffling effects and Eldrazi, but putting that many cards in your opponents hand could be just as bad. So you might cause your opponent to lose a few life, but remember this will hit you on your own turn next. 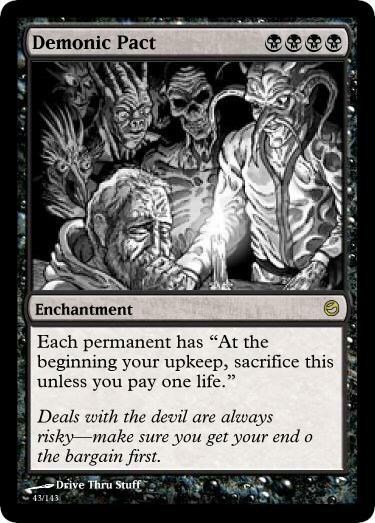 Of course you can sacrifice it, but it's other triggers on your permanents will still happen. 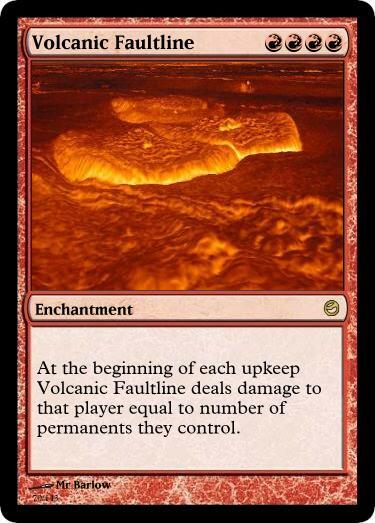 At the beginning of each upkeep Volcanic Faultline deals damage to that player equal to number of permanents they control. 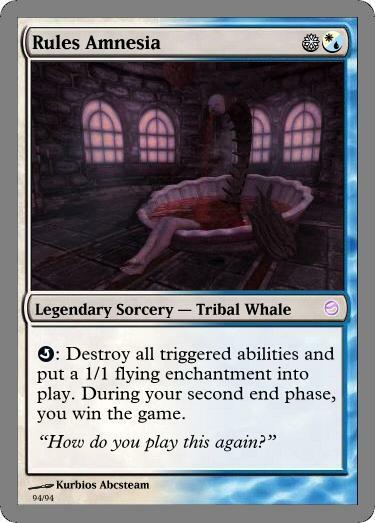 I was thinking of cutting the cost on this one to make it playable, but it's still pretty powerful. It will hit yourself, but most of the time you wouldn't care--I mean c'mon! You're playing Red! All creature spells may be cast as though they had flash. 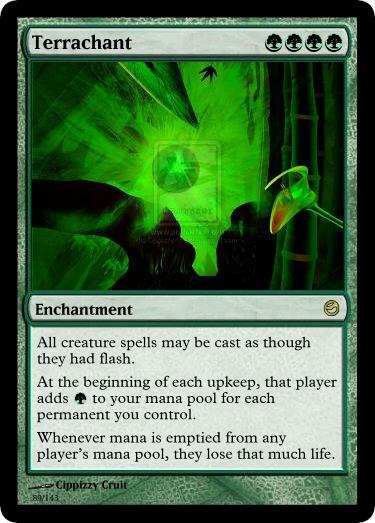 At the beginning of each upkeep, that player adds G to your mana pool for each permanent you control. 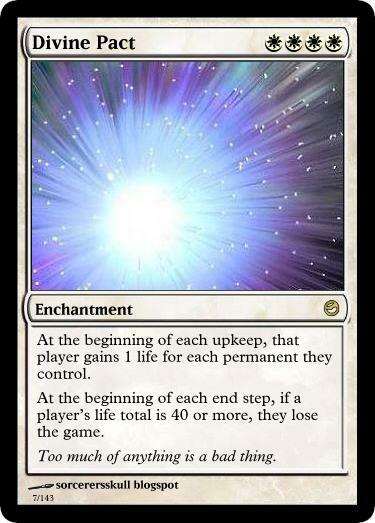 Whenever mana is emptied from any player’s mana pool, they lose that much life. The one Lolzor wanted to make. Probably the best of the lot of them. The additional clause makes it so there's a penalty and a way to kill yourself to keep it with the cycle. It gives your opponents creatures flash, but would be amazing against control decks, since they seldom play creatures and the mana is green. Or you can cheat using this with Omnath, Locus of Mana. I hope you enjoyed the cycle this week! Come back Wednesday for a new comic!